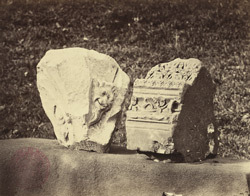 View of two fragments of carved masonry from Kenilworth Castle in Warwickshire. This is one of 23 photographs illustrating an 1872 guide to the history and architecture of the castle by the Reverend E. H. Knowles. He observed: “Two or three beautiful fragments of Early Decorated work have been discovered, sufficient only to prove that the building to which they belonged was of a very high excellence. It would not be possible, I think, to do finer work in sandstone. Some of them perhaps belonged to a Royal Seat.” Kenilworth is the largest castle ruin in England and dates from the 12th century. During the medieval period a range of stately halls embellished with finely-carved stonework were built next to the original Norman keep, turning the castle into one of the country’s most magnificent noble residences. These stone fragments feature on the left a grotesque bearded face and on the right a sinuous briar motif below bands of trefoils. The Decorated style of Gothic architecture dates from the late 13th century. It is so called for its emphasis on the lavish use of decoration on surfaces such as arches and gables, especially stylized repeated patterns.